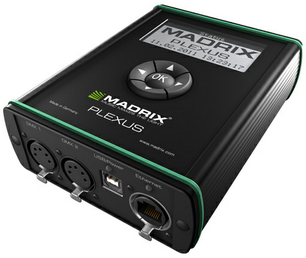 MADRIX PLEXUS is a USB 2.0 DMX512 interface or Art-Net node. The device can be used as a live controller [Live Mode] or stand-alone interface [Stand-Alone Mode]. ▪ MADRIX PLEXUS already includes the MADRIX software license for 1024 DMX channels. The data output [the license] is automatically activated when you connect the PLEXUS to a computer that has the MADRIX software installed and running and the USB and/or Ethernet drivers enabled in the software.